New baby bauble with the words" welcome to the world". Filled with tiny baby feet and feet charm. Ribbon bow to top. Can be different colours and can be personalised. Christmas baby stocking set. Brand new with tags/packaging. Was given as a gift at Christmas, but never opened or used it as the sleeping suit was wrong size. A few things are possibly from Matalan or Card fair. Really nice gift to give a baby of ages 9-12/12-18 months on their first Christmas. Giving a personalised gift shows the recipient that you truly care, as you have made the effort to choose a gift that is personal. 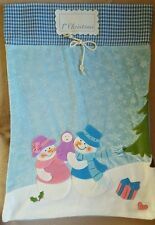 PERSONALISED CHRISTMAS STOCKING SANTA SACK, ANY NAME MANY NEW DESIGNS & SIZES! IT'S A GIRL table confetti. Great for baby showers, inside greeting cards etc. Personalised Range. Large 30cm x 20cm x 14cm. 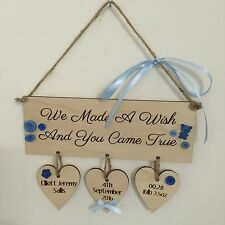 Personalise with Baby's Birth Details. Lidded wooden box with handles. Add weight, date and place of birth. With engraved detail on the lid. Soup Bowls Lids & Spoon. My 1st Christmas - teddy bear design. Cash on collection. COLLECTION /. BLUE XMAS JUMPER. PLANT PALS. UV AND FROSTPROOF. Brand New Fabulous BAUBLE ‘We’re Expecting’ 10cm by Coton Colors Collection by Laura Johnson Grey Bauble with Stork 10cm ‘We’re Expecting’ Comes in a lovely box! Great as a present! Remind your family about most important news this year and decorate your Christmas Tree! New 'Mum to Be' Sash in purple colour with black print. Great for the 'mum to be' to wear at baby shower! 11-01-2018 15:27:42. 2 Lansdowne Crescent. Item has small front pocket ideal for hiding an extra gift! IT'S A BOY table confetti. Great for baby showers, inside greeting cards etc. Personalised Range. Large 30cm x 20cm x 14cm. Lidded wooden box with handles. With engraved detail on the lid. Choose your own icon Soup Bowls Lids & Spoon. -Unicorn, Dinosaur, Car, Bow, footprints or a Star (see last image). With ribbon to hang. Machine washable and will retain shape. Super value for 60pc baby hangers, The baby clothes hangers are perfect for keeping baby clothes clean, tidy and organised, The hangers are made out of PP Plastic. PERSONALISED ACRYLIC BAUBLE. Laser cut bauble made from 4 mm acrylic and engraved. Personalised Christmas Tree Bauble. This item is made from Birch Ply. and a Satin Bow. Teddy Bear Shaped Design. TEDDY DESIGN. BABYS FIRST CHRISTMAS. we will do our upmost to endeavor to resolve the issues. Light brown soft plush rabbit. Contrast cream corduroy under ears and on paws. Hook and loop fastening on paws. Separate micro fleece cream blanket with contrast blanket stitched edge (width 90cm length 75cm). Giving a personalised gift shows the recipient that you truly care, as you have made the effort to choose a gift that is personal. Pink / Silver. Boxed sets of baby notecards - set of 2 boxes, each with 10 cards and envelopes. These are cigarette style boxes with a lid and a base. Pink matching envelopes, cream inside. Matt laminated box and cards. Personalised bocs atgofion. Welsh Personalised Range. Large 30cm x 20cm x 14cm. With engraved detail on the lid. Choose your own icon Lidded wooden box with handles. Soup Bowls Lids & Spoon. -Unicorn, Dinosaur, Car, Bow, footprints or a Star (see last image). Suitable for boy, girl adult. Boxed sets of baby notecards - set of 2 boxes, each with 10 cards and envelopes. These are cigarette style boxes with a lid and a base. Blue matching envelopes, cream inside. Matt laminated box and cards. Here up for sale is a Personalised Hand Crafted bauble. The bauble is made out of plastic so shouldn't smash if dropped unlike most glass ones. The bauble is then closed together and a ribbon is attached for you to hang it by and a bow is sewn on. 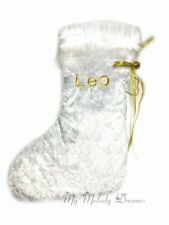 New ex-John Lewis stock- Snowman & The Snowdog - Baby’s 1st Christmas Stocking. RRP £6.00. Perfect for babies first Christmas. Clothing & Footwear. Baby Products. Also available in pink. Halloween & Fancy Dress. Perfect for your kids or to give as a gift! Colour: Blue. Low Prices. Handmade Decoupaged Christmas wooden plaques Decoupaged using napkin technique and then varnished. Super value for 20pc baby hangers, The baby clothes hangers are perfect for keeping baby clothes clean, tidy and organised, The hangers are made out of PP Plastic. 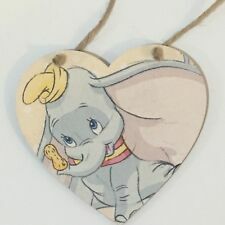 No longer needed, my first Christmas 2018 wooden heart shaped plaque / decoration. Has string to hang it up. Ideal New Baby or Christening Gift. Beautiful White Clay Baby Doves Hanging Decoration. Each piece is handmade and therefore unique. 1 x BIRCH PLYWOOD ENGRAVED SIGN STRING, RIBBON & HEART AS STANDARD FOR HANGING WITH AS PICTURED. TOP QUALITY BESPOKE UNIQUE PRODUCT. LIGHT BLUE RIBBON SUPPLIED AS STANDARD IF NO COLOUR SPECIFIED .